Posted on April 21, 2014 by Worth Stopping By . . . I totally cheated when I made this salad. 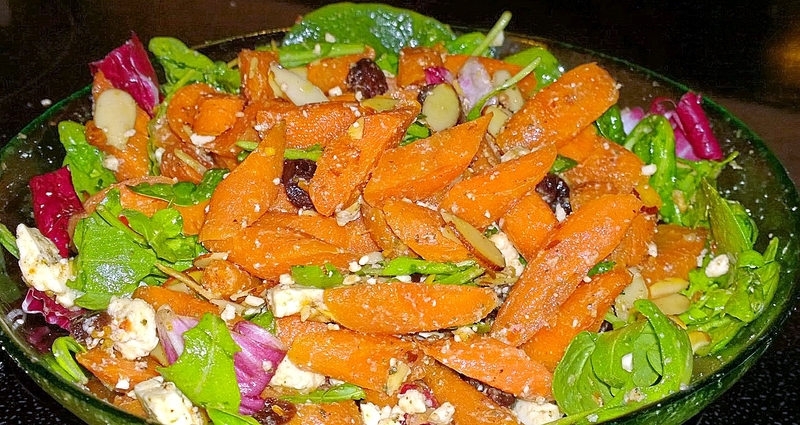 My guys loved the Roasted Five-Spice Carrots so much that they asked that I use them in this salad. I sautéed the garlic and almonds in a little olive oil and added them to my roasted, sliced carrots. The BK can’t have cranberries so I substituted dried cherries, soaking them in hot water first to soften them. This recipe has just a touch of honey and cider vinegar as a dressing — a sort of “dry salad”. This is another recipe that combines flavor, texture, and color beautifully. I have reduced the original recipe (from allrecipes) by half. 2. Combine the carrots, almonds, and garlic in a mixing bowl. Drizzle with the olive oil, then season to taste with salt and pepper. Spread out onto an ungreased baking sheet. 3. Bake the carrots in the preheated oven until soft and the edges turn brown, about 30 minutes. Remove and allow to cool to room temperature. 4. Once cool, return the carrots to the mixing bowl, and drizzle with honey and vinegar; toss until coated. Add the cranberries and blue cheese; toss again until evenly mixed. Combine with the arugula and serve immediately. Posted on April 14, 2014 by Worth Stopping By . . . I have been eating tuna like crazy lately in an effort to increase the amount of omega-3 in my diet. I know that canned tuna is not as rich a resource as fresh; however, it does contain a little more than 50% of the real deal. Make sure that you buy Premium Pacific Albacore that is packed in spring water. When it’s packed in oil, the omega-3 in the tuna leaches out of the tuna and into the oil. Since water and oil don’t mix, the omega-3 is retained when tuna is packed in spring water. I found the recipe below on allrecipes.com. You can substitute fresh grated carrot for the apple in this recipe if you don’t have one on hand. 1. Stir the tuna, olive oil, mayonnaise, apple, onion, relish, and dill together in a bowl until evenly mixed. Season with salt and pepper. You can serve immediately, though is tastes much better after being refrigerated overnight. 2. Cut large heirloom tomatoes into wedges taking care not to cut all the way through to the bottom. Remove and discard seeds and any tough white core remaining. 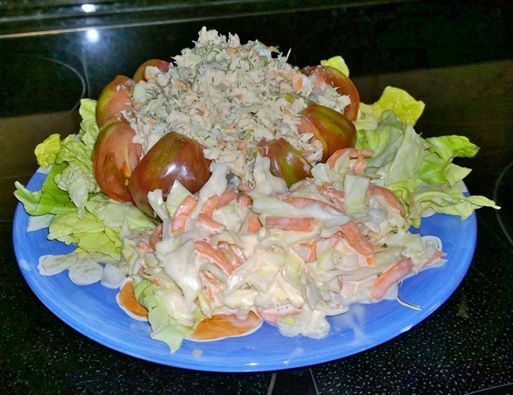 Stuff tomatoes with tuna salad mixture. Garnish with dill weed. Posted on April 10, 2014 by Worth Stopping By . . . Lately, my favorite grocery store has been stocking some beautiful asparagus. This is a beautiful, elegant salad that I have been working on; however, it lacks something — it needs dimension. Next time, I think we will add more parmesan shavings, toasted walnuts, and maybe some dried cherries(?). I would like to try to perfect the recipe that I found on epicurious.com. This salad would be so lovely at a dinner party. Any suggestions? 1. Working with 1 asparagus spear at a time, use a vegetable peeler to shave spears into long, thin shavings. Transfer to a medium bowl (the tips will snap off as spears get thinner; add to bowl). I like to prop my spears on the handle of a large wooden spoon when working with them. 2. Combine grated Parmesan and lemon juice in a small bowl and slowly whisk in oil until well blended. Season vinaigrette generously with salt and pepper. Drizzle vinaigrette over shaved asparagus and toss to coat. Posted on April 7, 2014 by Worth Stopping By . . . Lately, we have been skipping breakfast in lieu of a mid-morning salads. The combination of flavors and textures in this Strawberry Avocado Salad from allrecipes.com are phenomenal. A great way to start the day. 1. In a small bowl, whisk together the olive oil, honey, vinegar, and lemon juice. Set aside. 2. 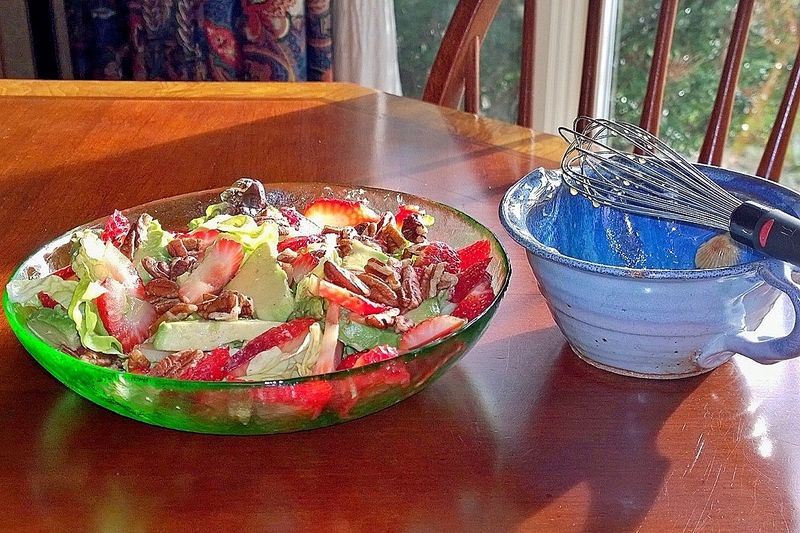 Place the salad greens in a pretty bowl, and top with sliced avocado and strawberries. Drizzle dressing over everything, then sprinkle with pecans. Refrigerate for up to 2 hours before serving, or serve immediately. Posted on April 6, 2014 by Worth Stopping By . . . When I the served the Rosemary Ranch Chicken Kabobs the other night, I reserved some quinoa to make a salad later. Quinoa is a seed — a grain that is strangely related to both spinach and tumbleweeds! It’s considered to be a superfood. It is not only a complete protein, but it’s gluten-free and a great source of dietary fiber and calcium. This recipe (from allrecipes) also includes some of our favorite healthy ingredients. I allowed this salad to sit overnight in the refrigerator to allow the flavors to develop and to allow the salad to absorb the dressing. 1. Whisk olive oil, lime juice, cumin, salt, and red pepper flakes together in a bowl. 2. 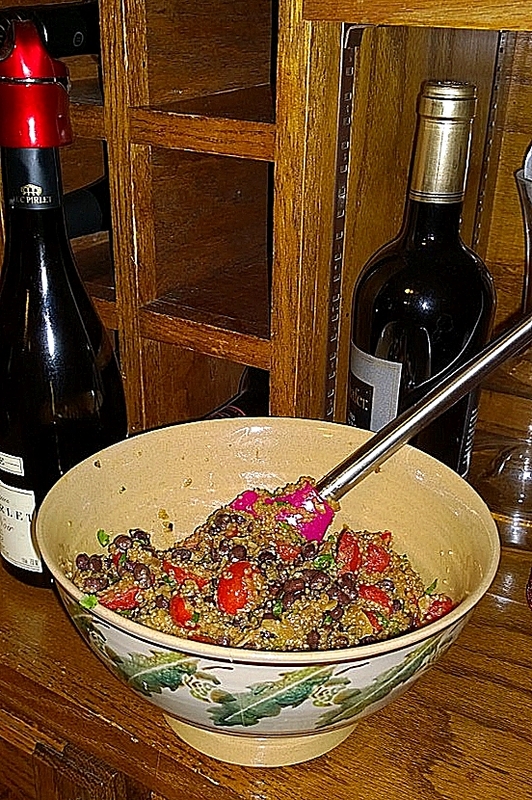 Combine quinoa, tomatoes, black beans, and green onions together in a bowl. Pour dressing over quinoa mixture; toss to coat. Stir in cilantro; season with black pepper. Serve immediately or chill in refrigerator. Posted on April 3, 2014 by Worth Stopping By . . . Nothing makes me happier than finding the freshest of the fresh ingredients. 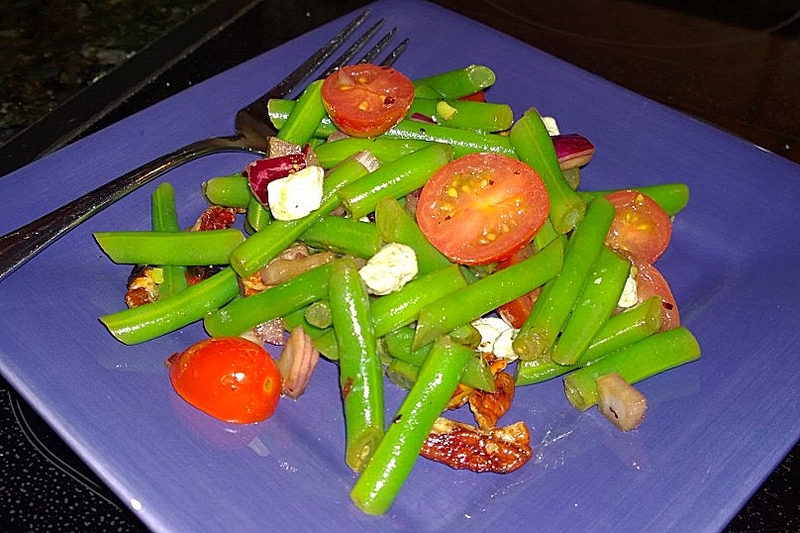 I came across some green beans that were too pretty to cook — I wanted to keep them as fresh and crisp as possible. I settled on a cold salad (from allrecipes) finished with a simple vinaigrette. The Champagne Balsamic Vinegar adds a beautifully clean and crisp flavor to the vinaigrette. to become fragrant and turn slightly darker. 2. In a medium bowl, combine beans, onion, and pecans. 3. Combine olive oil and balsamic vinegar in a cruet or small jar. blue cheese just before to serving.